Menlo Investments Limited, UK. Hijacked by Scammers!!!!! This Scammer hijacked Menlo Investments, a legitimate company and used it to scam Hundreds of Thousands of Dollars posing as an authentic BG & SBLC Issuer when the whole time he was 100% Fake. What is better than hijacking a real, authentic, legitimate company, that has been trading for years with no negative publicity which has a respected UK Attorney as a Director who signs all your documents and the business has disclosed public links to Barclays Bank, has offices in Londons Banking HQ AND has.... Publicly filed accounts showing a 86 Million pound Profit in 2015. Menlo Investments Limited which was Incorporated on the 5th December 1997 was the perfect target and sadly scammers have taken full advantage of it. This scam has probably only been operating from the 27th September 2016 until today's date 2nd December 2016 and in that period of just over 2 months staff at the "genuine" Menlo Investments office have advised they know of at least 12 clients who have been scammed and lost hundreds of thousands of dollars. 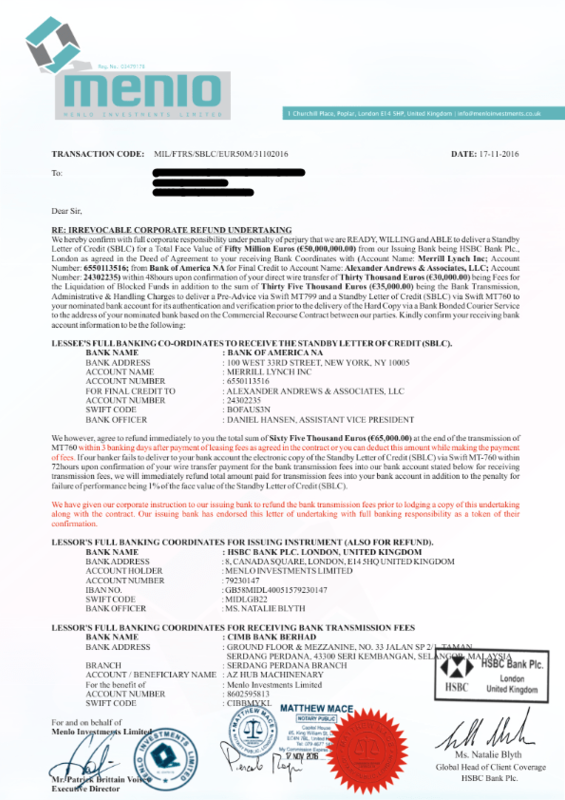 When this client came to Secure Platform Funding to have us monetize a SBLC from Menlo Investments Limited in the UK issued by HSBC Bank, London, our Compliance Department reviewed the Menlo Investments documents and warned the client not to proceed. The Client ignored our WARNING and was scammed out of $65,000 Euros and the scammers wanted a lot more! The Secure Platform Funding warning was based on simple maths! 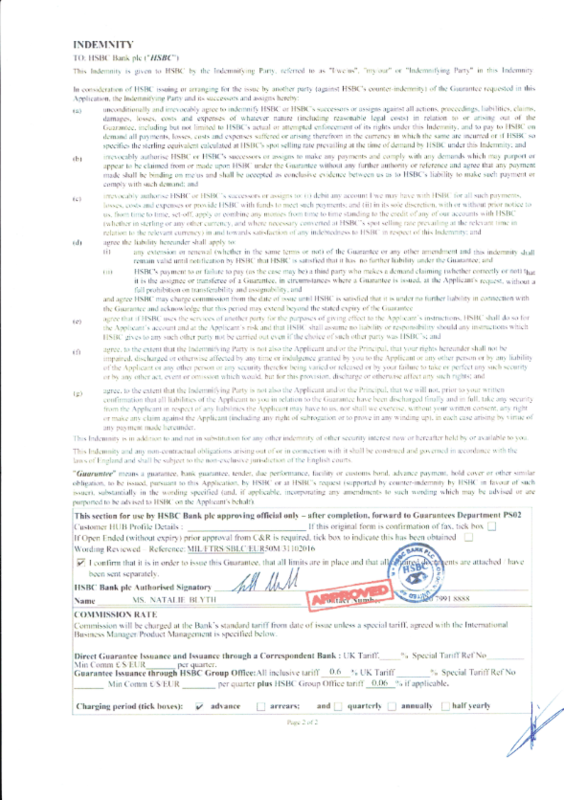 Menlo Investments documents offered the client the delivery of a 50M HSBC SBLC for just $35,000 Euros. The Bank fees for the delivery of an 50M SBLC are significantly higher than $35,000 Euros so it was clear there was no possible way that Menlo Investments the SBLC issuer could have delivered the SBLC for the price they were charging the client. But the client who was motivated to pay as little as he could, ignored our advice and proceeded to engage Menlo Investments to deliver a 50M HSBC Bank, London SBLC to us for Monetization. BIG MISTAKE! In life you get what you pay for. Pay peanuts get peanuts! Banks dont give Bank assets away cheap, they never have and they never will. 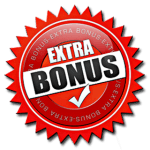 The client paid $65,000 Euros (because once the client paid $35,000 Euro to the scammer, he then said they needed more money to deliver the SBLC, so the client paid them another $30,000 Euros, Total Loss $65,000 Euros). And the client received NOTHING! NO SWIFT, NO INSTRUMENT AND EVENTUALLY NO EMAILS OR PHONE CALLS REPLIED TO! Here is a brief look at the scam..... 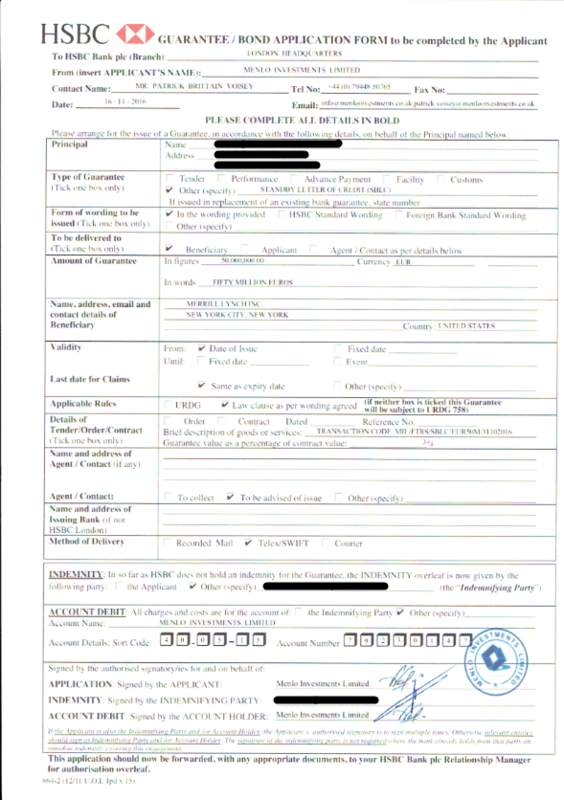 The Documents below are real documents from this scam but have been redacted to remove the name of the client who was victim. The Scammer used this domain name below in all communications to scam clients, so either the scammer registered this domain name so he could use it exclusively or he hacked the "genuine" Menlo Investments email server. 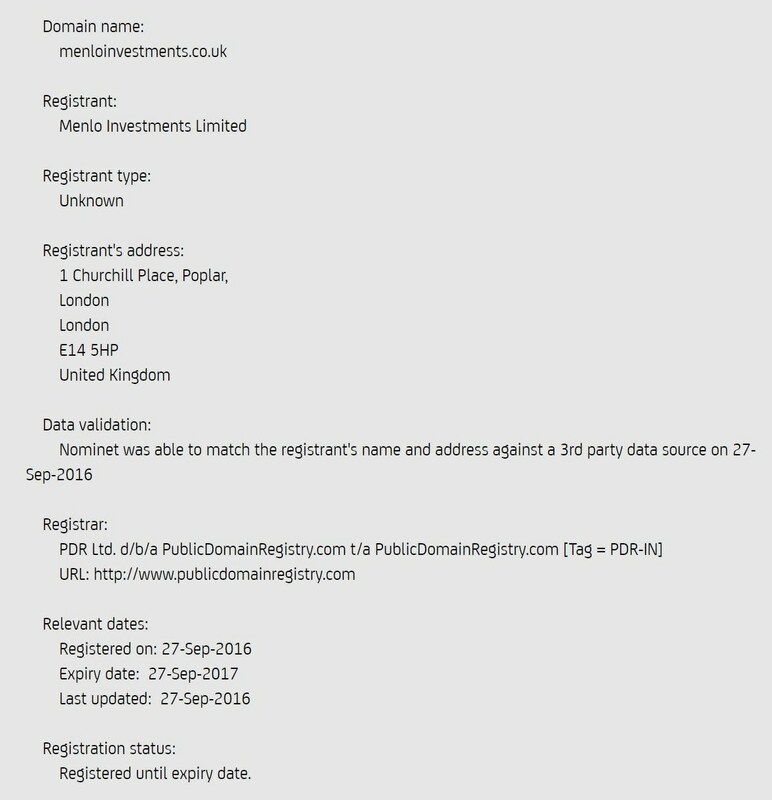 Either way the scammer used menloinvestments.co.uk which is actually registered to the "genuine" Menlo Investments address to represent himself as Patrick Brittain Volsey, Menlo Investments Director and Attorney - full details here. 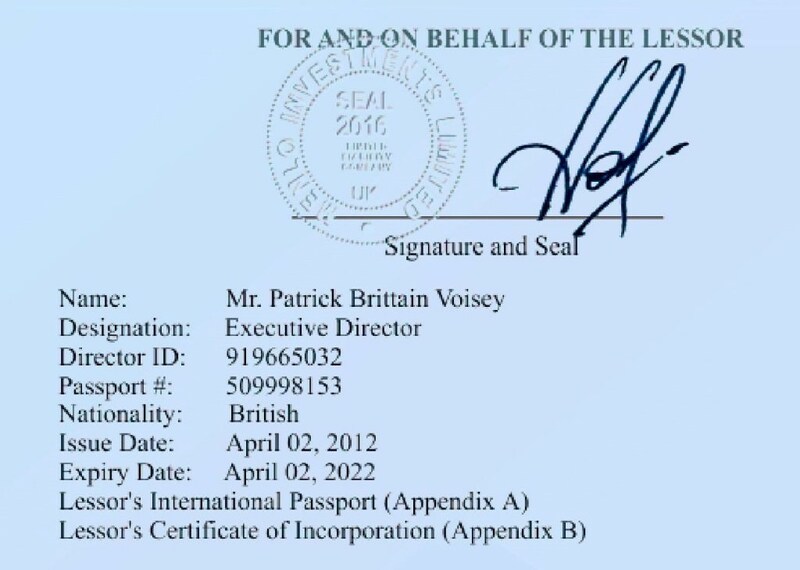 Menlo Investments Director & Lawyer Patrick Brittan Voiseys Passport used on all Scammer Documents! 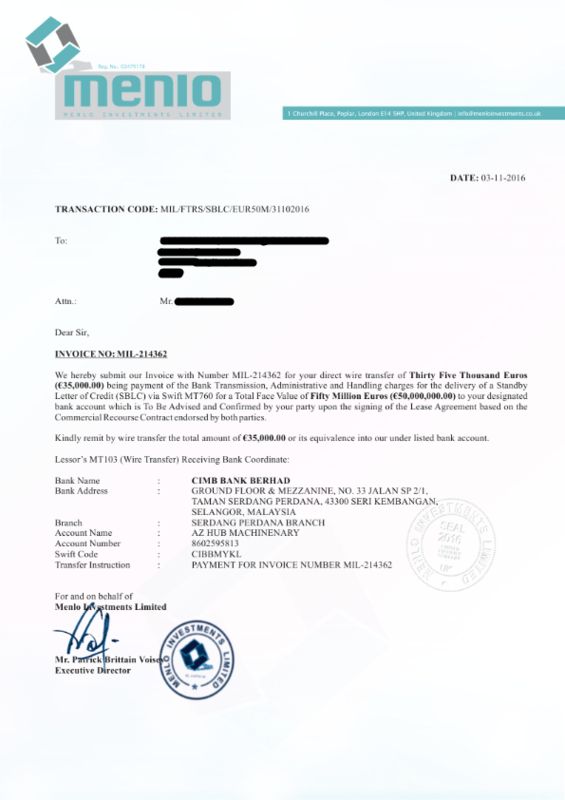 Menlo Investments Signature, Company Seal and Director ID used on all Scammer Documents! 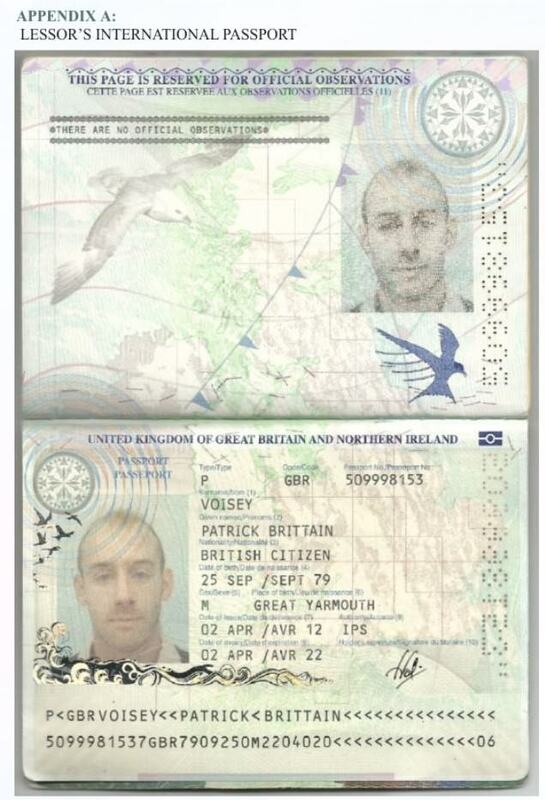 This was a sophisticated scam where either Menlo Investments have experienced a significant data breach or the Scammer has taken a lot of time recreating himself as Menlo Investments Patrick Brittain Voisey to maximise the revenue from his scam. The Scam was finally uncovered when Menlo Investments delivered NOTHING, no RWA, no swift MT799, and no Swift MT760. 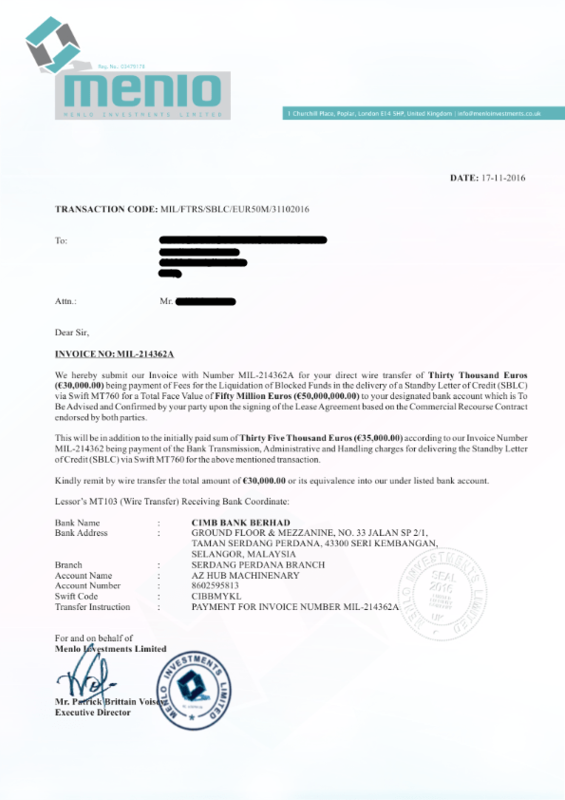 At Secure Platform Fundings request the client flew from Europe to Menlo Investments offices in London and to HSBC Bank in London to verify sadly that he was the 12th Victim to be scammed using the above documents. Currently there is no warning about this scam on the internet, we have written this article to save more victims from entering the scam and by disclosing the scam we hope to bring a stop to it. It should be noted that Menlo Investments Limited is a legitimate business with significant turnover and assets, sadly their legitimate business has been misused seemingly without their knowledge or consent and they are a victim as much as the clients who have lost money to this scammer are. It would be wise for Menlo Investments to issue a public statement on this scam and the misrepresentation of their business by the scammers. We would welcome a public statement by Menlo Investments and would happily publish it here or link directly to it.